SeaWorld San Diego will celebrate a world of flavor at the 2nd Annual SeaWorld Seven Seas Food Festival, kicking off on Saturday, May 7 and continuing for five weekends after that. Returning are all the delectable culinary creations from SeaWorld Executive Chef Axel Dirolf and his expert culinary team. Craft beers along with wines from California will be paired with globally-inspired cuisine featuring local, sustainable ingredients and unique signature flavors from around the world. The hub of the SeaWorld food festival will be the California fusion flavors area where guests will not only savor epicurean delights from across the state, but also the sounds of live bands pulled straight from the San Diego music scene. Throughout the park visitors will embark on a global gastronomic voyage, getting the chance to enjoy diverse flavors from Baja, South America, Asia, France, Mediterranean and the Caribbean. Each culinary area will feature themed architectural facades that will immerse guests into the cultural landscape of their particular region. Also, some of San Diego’s top craft breweries will again be featured at this year’s food festival, including Green Flash, Stone, Alpine, Coronado, Mike Hess and Karl Strauss. Beer aficionados will be able to interact with the folks that create their favorite craft beers to ask questions, get some home brewing tips or just listen to fun brewing stories. New breweries will be featured each of the 6 weeks. Wine will also be offered by experts at the California Wine Tasting Room and the new French Wine Boutique. New this year, visitors can take the flavors home with a purchase from the California Wine Room. There will also be an all-new Polynesian Flavors area - a tropical paradise themed experience that will be complemented with icy mai tais and piña coladas from the new Tiki bar as well as handcrafted ales and lagers at the Maui Brewing Co. beer cart for those thirsting for a more hoppy experience. Immersive Entertainment including high-energy hula and haka performances will have guests dancing with the aloha spirit. Fire dancers will also sizzle out the evening and leave guests alight in amazement with blazing performances showing twice nightly. SeaWorld’s commitment to local sustainable food, recycling, conservation and environmental stewardship will be highlighted in several of the festival areas. Guests will also be invited to relax in the Green Lounge where they will be able to play food and conservation-themed games. With nine different culinary destinations throughout the park, guests will be able to sample more than 50 different mouthwatering food choices. A sampling of the menu items include Lomi Lomi Salmon at Polynesia Flavors, Lava Rock Grilled Oysters at Polynesia Flavors, Coca-Cola Flavored Nitrogen Ice Cream at Coca-Cola Flavors, Cave-Aged Humboldt Fog Cheese at California Flavors, Seared Diver-Caught Sea Scallop at California Flavors, Macaroni-Shrimp with Chorizo, Panela Cheese and Chives at California Flavors, Escargot Maison at the French Flavors and so much more. 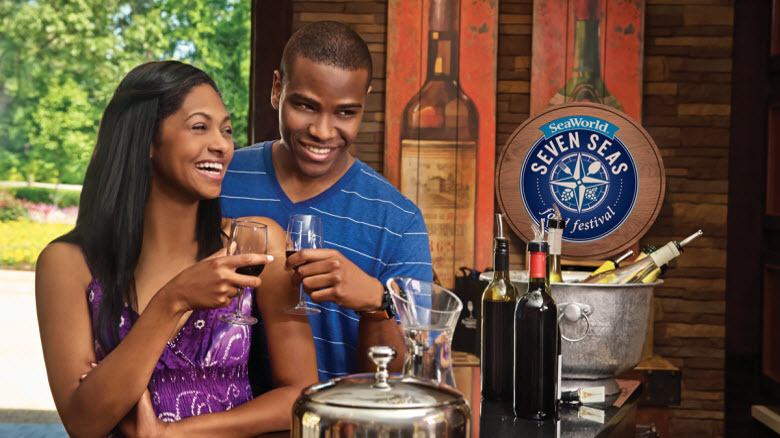 While dishes can be purchased individually at each location, the best way to experience the Seven Seas Food Festival is with one of three “sampler” packages. Guests will be able to choose their own culinary adventure with up to five food and five drink items from any of the festival’s food locations with the Food and Drink Sampler for $40. New this year is the Wine and Dine Sampler that includes choice of five, 1 ounce wine samples and five food items, a Seven Seas souvenir glass, and a 10% discount on all merchandise at the California Wine Room for $35. The Food Only Sampler is available for $20. 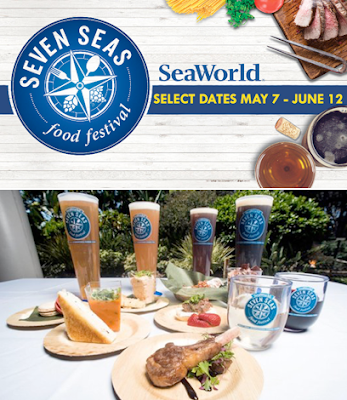 The SeaWorld Seven Seas Food Festival dates are May 7-8, 14-15, 21-22, 28-30, June 4-5 and 11-12. For more information, visit SeaWorldSanDiego.com or call 800.257.4268.